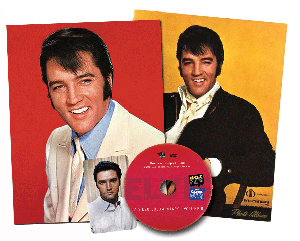 Housed in a reproduction of the rare ‘69 Vegas menu, this great DVD contains the complete, unedited footage of Elvis in Chicago in 1957, on leave from the US Army in 1958, and rare 1961 Memphis clips. And, for the first time in amazing quality, both the ABC and NBC Madison Square Garden press conferences (with more unreleased footage from this historic press conference) and much, much more. Includes a free 2017 pocket calendar! A professionally filmed and edited DVD capturing an evening with Elvis' former girlfriend, Mindi Miller, in the UK. Enjoy Mindi's interview about her time with Elvis and see how Essential Elvis UK pays tribute to the King. This DVD is region free and will play on any DVD player worldwide. On Sunday, May 19th 2013 we staged a wonderful Elvis event with Bill 'Superfoot' Wallace in the UK. This sell-out event was professionally filmed with the view to releasing this exciting DVD. See Bill demonstrate some of Elvis' favorite karate teqniques and hear him talk about his time with the King and the Memphis Mafia. We know you'll enjoy this beautifully produced DVD-R program, which will enlighten you as to what goes on at our Elvis events. If you were there, this will be a GREAT souvenir of your day. In late October 2012 Joseph A Tunzi will release Elvis: Hot Shots And Cool Clips, Volume 6 housed in a reproduction of Elvis Presley's rare 1975 Hilton showroom menu. The DVD contains footage of Elvis in Las Vegas 1972, Kansas City 1972, Chicago afternoon show 1972, St. Louis 1973, and Elvis' very last Las Vegas show in 1976. Menu measures 17" x 14". The majority of this DVD was filmed during Jeanne's trip to the UK in 2008. She was captured talking candidly about her time with Elvis at Graceland, on tour and in Vegas. She openly discusses how she was able to enjoy a close relationship with Elvis through her friendship with Linda Thompson, how she became a secretary at Graceland and what went on during those years. Hear her memories of spending Christmas at Graceland, the gift of a sportscar and her fallout with Vernon Presley, Elvis' father. Her memories of those times are funny, fascinating and extremely riveting. Jeanne is a great talker and her warmth comes across beautifully in this 60-minute programme. You'll also enjoy some incredible private footage on Elvis in Vegas 1970-71. Jeanne LeMay and Linda Thompson met in 1972 while competing in the Miss USA Pageant and quickly became friends. It was through Linda that Jeanne was able to get an insider's look at Elvis Presley's personal life. Jeanne accompanied Elvis and Linda on the tour circuit and later went to workl at Graceland as a secretary. She enjoyed Christmas at Graceland and was given many special gifts, including a yellow sportscar. Now, Jeanne's incredible story is here on DVD for fans to enjoy. This DVD includes NEVER-BEFORE-SEEN 1974 footage of Elvis in Vegas on August 29th (M/S), September 1st (D/S), September 2nd (C/S) and in Kansas City, Missouri on June 29th (A/S).